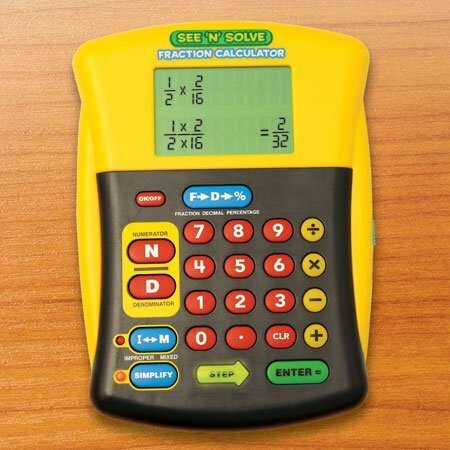 The See ‘n’ Solve Fraction Calculator is the only user-friendly calculator on the market that shows students how to solve a fraction problem, step by step! The easy-to-use format reinforces introductory fraction skills without the complications of other scientific calculators – making it perfect for school and home. Students can add, subtract, multiply, and divide fractions easily. Press the special Numerator and Denominator keys to input a fraction problem. The large 2-line screen displays the problem (with common denominator), and lighted keys guide students through the steps to solve it. Special keys instantly simplify fractions or convert fractions to decimals or percentages. A terrific way for students to see and understand how to solve any fraction problem!